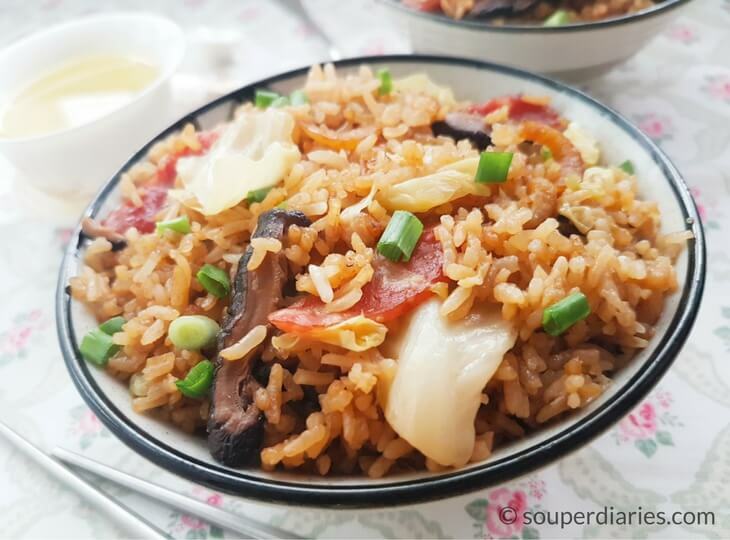 Chinese sausages, sliced pork, cabbage, mushrooms, dried shrimps and shallots come together in this Chinese Sausage with Cabbage Rice to create a delicious one-pot meal. Every now and then I love making one pot rice meals such as this Chinese Sausage with Cabbage Rice. It’s really easy and convenient. I only have to cook once and it will be enough for both lunch and dinner so it saves me the hassle of cooking multiple dishes. More importantly, the rice tastes delicious and my whole family enjoys it. Did I also mention that there’re less things to wash? You won’t go wrong with a cabbage and Chinese sausage pairing. Other must-have ingredients for me in this rice are mushrooms and dried shrimps. The addition of spring onions as garnishing provides a fresh contrast to this rich tasting rice. There are several ways to make a one-pot rice meal with a rice cooker. Below is a summary. 1. Put rice to cook in a rice cooker. Stir-fry vegetables, meat and seasoning in a wok. Pour all the stir-fried ingredients into the rice cooker when the cooking time is almost up and mix well. 2. Stir-fry rice together with vegetables and seasonings in a wok before transferring everything into a rice cooker to complete the cooking. See Chinese Mustard Greens Rice (Kai Choy Farn) using this method. 3. Briefly stir fry all ingredients (except rice) in a wok. Put uncooked washed rice in a rice cooker and pour the partially cooked ingredients into the rice cooker. Turn on the rice cooker to cook. 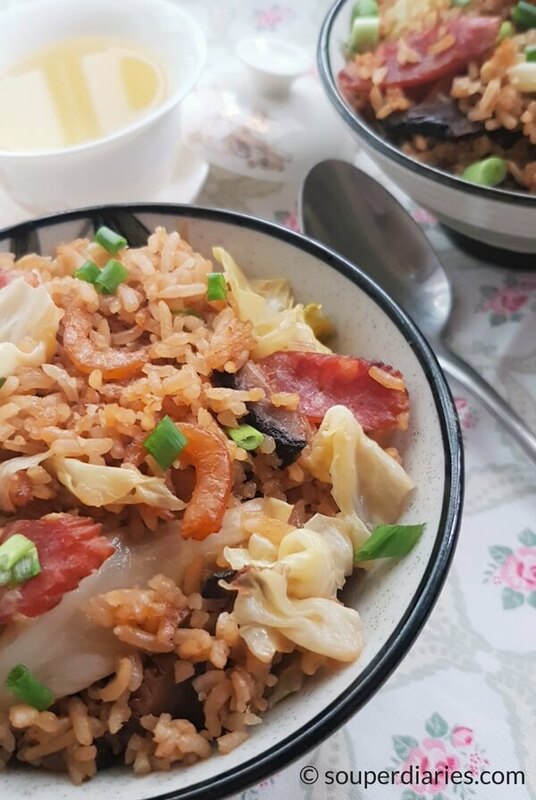 I used the third method for this Cabbage Rice with Chinese Sausage recipe. Whichever method you choose, the most important thing is the amount of water used. You can’t use the same amount of water as you would with cooking rice alone. It will result in mushy rice. Use less water as the cabbage will release some water and also the sauce contains water. If you’ve never tried Chinese sausages before, I think you’re gonna love it. It has a sweet, smokey and savory taste that reminds me of candied meat. Often made with pork, some Chinese sausages are made with livers (called yuen cheong), chicken and even beef. 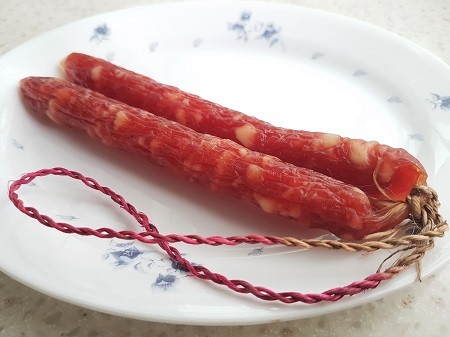 Known as lap cheong in Cantonese, Chinese sausages are hard air dried sausages. They have to be cooked before eating. Not all Chinese sausages are created equal. The main ingredients are usually pork and sweetened with rose water, rice wine and soy sauce. Different brands have their own variations of the ingredients and taste. When shopping for lap cheong, I try to find those with more pockets of fat. The fat that oozes out from them when cooking makes the rice very tasty. I know most people (including yours truly) shun fat but it is not always evil. Fat is flavor. I don’t really care about the Chinese sausages. Well, not as much as the rice. It is the rice that has been gently perfumed with the fragrance of the lap cheong and seasonings that I absolutely LOVE. Every kernel of rice is simply delicious and so flavorful. Here are the steps to cook this Cabbage Rice with Chinese Sausage. 1. Heat up oil in a wok over medium-high heat. Fry shallots for a while before adding dried shrimps. Fry till fragrant. 2. Add the Chinese sausage slices and stir fry till fragrant. Add pork slices and mushrooms and continue to stir fry for about a minute. 3. Add cabbage leaves and mix everything well. No need to wilt the cabbage as it will be cooked in the rice cooker. Turn off heat. Remove contents from wok and place into a large bowl. Put rice and sauce into a rice cooker. The water level has to be lesser than the stipulated amount inside the rice cooker as the cabbage will release some water as it cooks. 4. Pour in the contents from the bowl into the rice cooker and let it sit on top of the rice. Close the lid and turn on the rice cooker to cook. When the cooking time is over, gently mix the rice and ingredients with a rice paddle. Let it rest for 2 – 3 minutes before serving. If you find the texture of the rice not soft enough, add slightly more water and cook for a few more minutes. Besides cabbage, the vegetables that I like to use for a one-pot rice are long beans and Chinese mustard greens (kai choy). Yam and pumpkin are also good choices. As the rice is very flavorful and rich tasting, I like to wash it all down with a soothing green tea. What is your favourite one-pot rice? I hope you’ll enjoy today’s recipe. Have a go at it and let me know how it turns out. Don’t want to miss any new recipes? Subscribe to Souper Diaries newsletter and have the latest recipes and updates delivered to your inbox! Don’t forget to follow me on Facebook, Instagram, Pinterest, Twitter and Google+ to keep up to date with all the latest happenings on Souper Diaries. 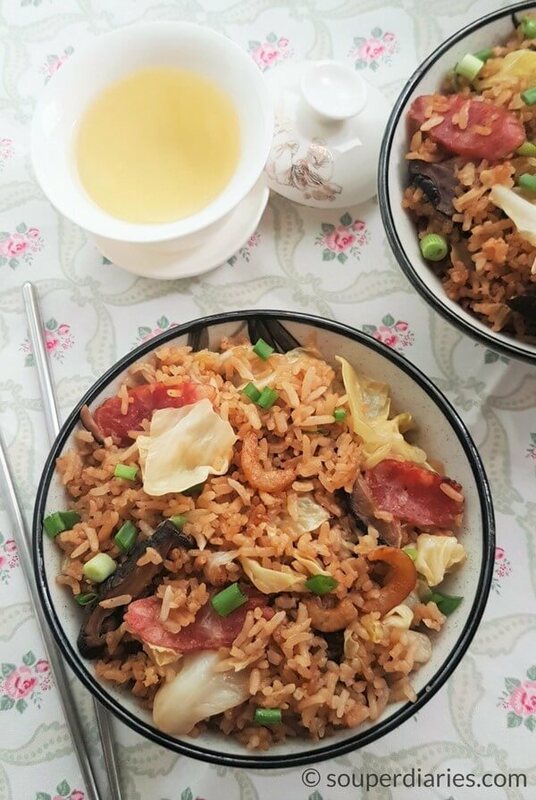 Fragrant one-pot rice made with Chinese sausages, cabbage, shiitake mushrooms, dried shrimps and rice. Cut or trim off the hard stems from mushrooms. Gently squeeze out excess water from each caps. Slice them thinly and marinate them together with the lean pork. Set aside. Put all the sauce ingredients in a bowl and mix well. Set aside. Heat up oil in a wok over medium-high heat. Fry the shallots for a while before adding dried shrimps. Fry till fragrant. Add the Chinese sausage slices and stir fry till fragrant. Add pork slices and mushrooms and continue to stir fry for about a minute. Add the cabbage leaves and mix everything well. No need to wilt the cabbage as it will be cooked in the rice cooker. Turn off heat. Remove contents from wok and place into a large bowl. Put rice and sauce into a rice cooker. The water level has to be lesser than the stipulated amount inside the rice cooker as the cabbage will release some water as it cooks. Pour in the contents from the bowl into the rice cooker and let it sit on top of the rice. Close the lid and turn on the rice cooker to cook. When the cooking time is over, gently mix the rice and ingredients with a rice paddle. Let it rest for 2 - 3 minutes before serving. If you find the texture of the rice not soft enough, add slightly more water and cook for a few more minutes. Optional: Drizzle with a little sesame oil. Garnish with some spring onions and serve. 1. The cooking time will vary depending on your rice cooker. 2. Chicken (cubed or sliced) can be used instead of pork if preferred. 3. When mixing the rice and ingredients in the rice cooker, I recommend using the rice cooker paddle to stir to avoid scratching the bottom of the rice cooker. 4. If not adding lean pork, it is not necessary to marinade the mushrooms. Hi Yvonne! Absolutely love this recipe and am planning to try it soon. Is it possible to leave out the dried shrimp? I can’t find any where I am. Yes, you may leave it out if you can’t find it. I just love reading your recipes and this one looks like something I would love. I think it’s also something I could make! I never even thought about adding more ingredients into the rice cooker. Stupidly, I thought it was only rice and water that you could add to a rice cooker. I can’t wait to give this a try for Chinese New Year. I have a lot of time off work so plenty time to prepare! One question if I may, how long do you fry the Chinese sausages for? I always end up burning them. Yes, you can add ingredients into a rice cooker when cooking rice to make a one-pot meal. You may also want to try this one-pot Chinese Mustard Greens Rice which is also very delicious. Besides rice, a rice cooker can also be used to make soups, congee, cake, bread, eggs, etc. Fry the Chinese sausage on medium-high heat till fragrant (a few minutes depending on how thick you sliced them). Do not use too high heat or they will get burnt easily. But I do know of people who don’t mind eating burnt Chinese sausage. Lol! This is definitely one of my favourite, especially with the Lap Cheong. Made a mistake checking your post at this unearthly hour. I’m going to raid my fridge for food to satisfy the craving your images brought to me. I am also a huge fan of one-pot meals! On those days where you never have a free moment, one-pot meals are a life saver. I enjoyed the summary of the recipe and how to cook it. I do have one question though, is it possible to cook this recipe without a rice cooker? Like, would I be able to use an ordinary pot or maybe a pressure cooker? Thanks and I am sure it was as delicious as it looked! Yes, it is possible to cook this without a rice cooker. You can use a dutch oven or any other heavy bottomed pot with a lid. But you’ll have to time the cooking time and check on it to make sure it doesn’t burn or dry out. Bring rice to a boil. Cover, reduce heat and simmer until rice is cooked through (about 20 – 25 minutes). I’m not sure about the pressure cooker as I’ve not tried it before. Your site always leave me feeling hungry and especially at this moment, that is bad, because it is 3:10 am in my country. Nice recipe and I love the convenience of one pot meals. I can think of a number of substitutes for the Chinese Sausage, if not available in my country. We have other sausages here that I could try. Many thanks, my son will enjoy this recipe. P/S: If you shop online, you can find Chinese sausages here.